In this quick guide about Monero cloud mining investment, we analyze profitability and sustainability of the said investment. 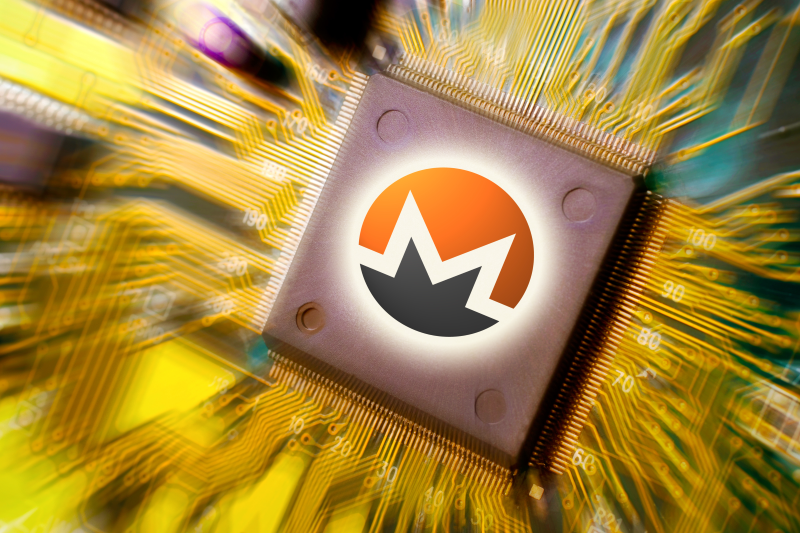 We first investigate the Monero’s mining difficulty and value fluctuations in recent period. Then, we go over important factors that you should keep in mind when choosing a plan. 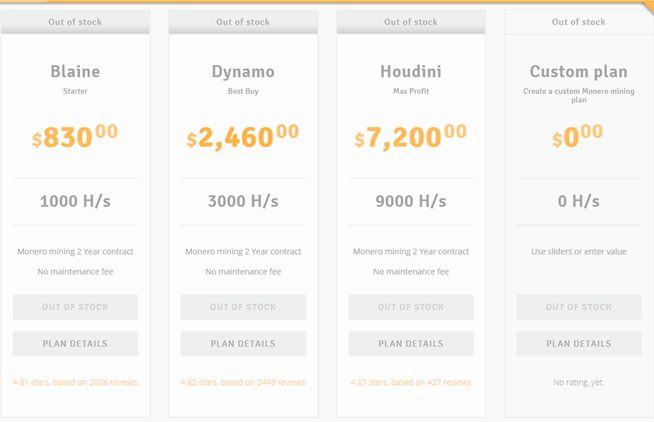 Genesis Mining is the only provider for Monero cloud mining contracts. Throughout the article, we compare findings with other coins, such as bitcoin, Ethereum, Zcash, DASH and Litecoin. We also go over individual platforms in terms of existing plans, the contract lengths, and fees included. Lastly, we provide the answer on how profitable is cloud mining the Monero currently. Monero, much like cryptocurrencies available for cloud mining, offers proof of work (PoW) algorithm that allows investors to mine them. The said algorithm is CryptoNight, a hash-based function system that is based on CryptoNote protocol. The blockchain offer publicly available ledger records where all transactions are viewable. The creator of the cryptocurrency, Nicolas van Saberhagen, made the said blockchain technology and token in 2014. It is important to note that, from the beginning, Monero was designed not to be mined by ASIC mining equipment. Idea was to create environment-friendly operations, since BTC spends more energy than entire Ireland at this point. Mining of the Monero uses either GPU or CPU. The difficulty of mining the awarded block tends to grow over time, as shown in chart below this text. Similar to other coins, with the exception of Zcash, Monero experienced sharp increase in last quarter if the year 2017. Since then, difficulty has been rising sharply each month, with trend expected to continue in this year as well. 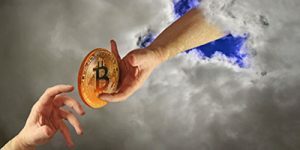 This will have significant impact on the level of XMR payouts form cloud mining contracts. The harder it gets to get a block, the less coin you will find in your wallet on daily basis. Thus, it is important to see value to match the difficulty as well. With falling volumes, value should increase as to get the money back over what you have invested at the beginning. The chart containing price value fluctuations for Monero coin shows that trend, more or less. The main cause for concern lies in First quarter of 2018, where value dropped sharply. The said drop was clearly caused by bitcoin, as charts containing BTC price show as well. Trend is even nearly identical with other coins, proving just how powerful bitcoin is. Thus, we can assume that Monero, although following difficulty somewhat with growing value, is a very risky coin to invest in at this moment. With industry analysis in mind, now is the time to consider what you should put into your calculator. He first thing, that you need to take into account for cloud mining profitability is difficulty rate. Monero blocks are awarded every 2 minutes (approximation) and with difficulty that does not change. What does change is the amount of hash power needed to get the said block. That is why cloud programs expressed in hash power would provide smaller daily payouts. XMR showed increased mining difficulty in recent months, even more so than value. The growth is steady, meaning that it is safe to say it will continue so for foreseeable future. Value, on the other hand, although generally growing, is showing large fluctuations. It means that if you invest now, one day you will lose in value and in other gain. We would definitely advise to hold the coins, as it seems coin will keep growing, though with large fluctuations. Lastly, keep a mind on contract length and maintenance fees together with the initial plan purchase. Monero usually uses fixed-time cloud mining contracting, with period varying from two to three years. Fees are usually not charged since GPU/CPU mining takes a lot less energy than bitcoin or Ethereum’s mining operations do. In most cases, as mentioned before, contracts tend to last for two to three years, depending on the platform. More importantly, these plans can be fixed in terms of hash power offered and fees or they can be flexible, where you choose the level of hash power needed. On the other hand, some platforms implement contacts that are not fixed in time but remain until cloud mining operations are deemed no longer profitable. That is why it is important to work only with known companies that have a history of fair business conduction. In many cases, you might pay for a contract, only for it to be cancelled in the matter of few months. Platforms that offer Monero cloud mining programs for you to use are genesis Mining and Minergate. We chose these as they are the most popular choices and the ones that have proven record of business conduction. 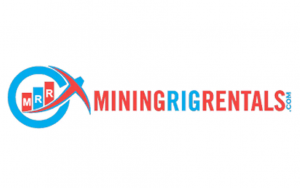 Founded in 2013, Genesis Mining is arguably one of the biggest cloud mining service providers in the world. With services available globally, you as an investor have several Monero programs to choose from. These plans are called Blaine, Dynamo, and Houdini, each having its own investment rules. The picture below provides necessary details about these plans. Contracts last for two years and there are no maintenance fees, due to the low-energy consumption of GPU/CPU mining equipment. The platform launched its operations in 2014 as a marketplace where variety of services exist for clients to use, cloud mining included. 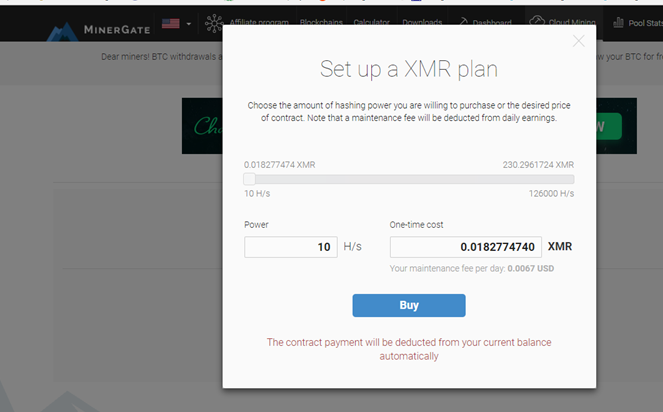 Much like Hashflare, Minergate offers a chance to choose your own hash power program, starting with 10 H/s for a price of 0.018277 XMR. The maximum power that you can purchase stands at 126.000 H/s while company employs maintenance fees. 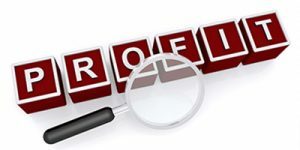 The fee level stands at $0.0067 per H/s. 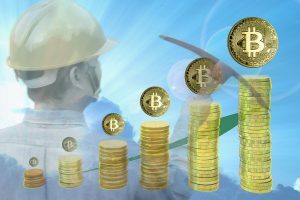 In this article about Monero cloud mining, we went over the industry in terms of Monero’s mining difficulty, price fluctuations, and available plans. We uncovered that Monero is in line with all coins, with exception of Zcash, in terms of high-risk and low return future. Difficulty has risen sharply while price, although closely following the difficulty, fluctuations greatly. Platforms are rare when compared to other coins, especially bitcoin, with prices being quite high for cloud mining hash power.